The world of Solaris was destroyed 40 years ago. Broken follows the struggles of the survivors living in the void of space afterwards. A fantasy campaign setting, the survivors depend on magic, psionics or steam technology for air, heat, food and entertainment in the cold void. 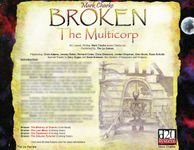 Broken: The Multicorp is written as a mini-documentary from the perspective of Multicorp, a huge future corporation which exists on a plane neighboring Broken. Rather callous, they discovered the survivors of Solaris, and did nothing to help them. Instead they use Broken as chance for television ratings. Sending contestants to die in Broken, Vor Stevenson has created the smash hit Void Survivor. In Broken, Player Characters’s play survivors from the destroyed world of Solaris or one of the races native to the void. They are not intended to participate or even know about Multicorp and it’s show, unless the GM decides they find out. The show is just one aspect of Broken which the Players might have to deal with in their struggle for survival in the void.